A pressure button (also known as a cushion plunger) is used on a recurve bow in conjunction with an arrow rest. It is a spring-loaded button that screws through the riser and sticks out above the arm of the arrow rest, in a position to just touch the arrow shaft when it is on the arrow rest. 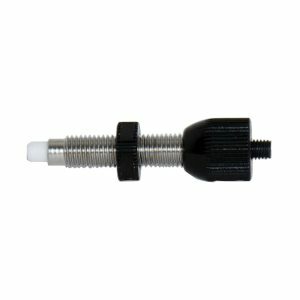 The pressure button compensates for the way an arrow bends as it leaves the bow (known as the archer’s paradox) and this can be fine-tuned by moving the button in or out and by adjusting the spring tension.